After years of executing ideas and concepts of others, he now paints subjects that are of personal interest. He was a finalist in the 2001 and 2002 Artists Magazine Competition. He received an award of excellence in the 2004 Oil Painters of America Eastern Regional Exhibition. He received an award of excellence in the 2006 Oil Painters of America National Exhibition, and received a 2007 Certificate of excellence award in the International Portrait Competition hosted by the Portrait Society of America. Hodges was awarded Signature membership status by Oil Painters of America in December 2008. He also won first place in the category, Portraits of Women, in the Members showcase of the Portrait Society of America 2009. 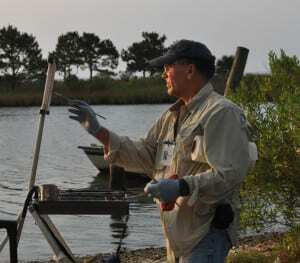 He is a Signature Member of the American Society of Marine Artists awarded 2010. He is also a member of The Portrait Society of America. 2011 Portrait Society Of America’s member showcase first place figure in landscape category. 2011 Oil painters of America Online competition, First place in Signature member category. 2012 Portrait Society Members showcase first place in non-commissioned category. His work hangs in private collections as well as the United States Air Force and U.S. Coast Guard permanent collections. The permanent collection of Golf Digest Magazine includes several of his paintings. As an artist, I believe in practicing the sound principals of painting that I have learned and currently teach, but I also believe in striving for something more than just the technical skill in my work. There is a feeling, or reaction, that one gets when standing in front of a painting or a piece of art. Sometimes, it is not an easy thing to describe. It might be the sense of place in a landscape, the light on the subject, or a fleeting expression in a portrait. These are the types of reactions that one hopes are communicated in his or her paintings. The best scenario is when the technical and the emotional parts of painting are inseparable.